The SG32-1500M Power Cable Fault locator is designed to provide quick, effective, accurate and safe fault location for 10 kV cables, thereby reducing system outages and minutes lost. The instrument comes in a rugged yet portable enclosure, which makes it suitable for use in and outdoor conditions. 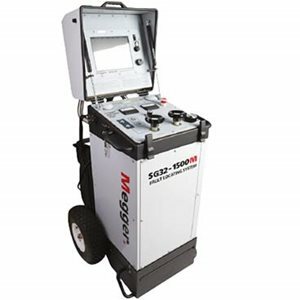 The SG32 provides all typical methods for cable testing: cable and fault diagnosis, pre-location of cable faults, fault conditioning, and pinpoint fault location using magnetic acoustic methods.